Fall has sashayed it's fabulous self on in and we've spotted a myriad of chic and sassy finds to add to our closets. 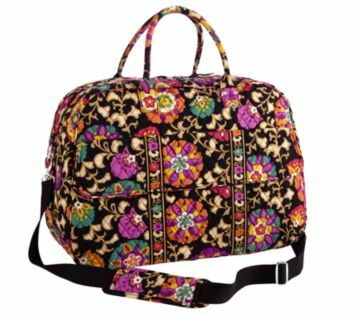 We adore the iconic Vera Bradley brand.. Always whimsical, stylish and a must-have for the fashionista. We recently attended a holiday press preview and were delighted by the myriad of splashy offerings from the fab folks at Vera Bradley. The Fall/Winter collection is comprised of classic Vera Bradley designs with a sleek infusion of modern designs guaranteed to get you noticed. We're totally smitten with the Grand Traveler (featured above) in Suzani. This bag is ideal for weekend getaways and also light enough for a busy bee like myself making the rounds at previews. The jewel tones are absolutely gorgeous and complimentary to any ensemble. I'm also loving the roomy interior, side pockets and the handy exterior ID window is a great added touch! Hint: The Grand Traveler is an awesome holiday gift-guide item.. Don't ya think?